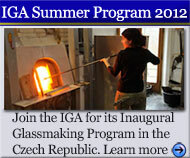 The International Glass Alliance is an organization founded in 2010 to preserve the rich traditions of glassmaking and glass education in the Czech Republic, promote the glassmaking region's standing as an economic, artistic and cultural center in the Czech Republic and throughout the world and serve as a platform for international exchange between glass artists, scholars, students, collectors and enthusiasts. Right now, the glassmaking region of northern Bohemia, its schools and glassmaking network, are threatened by the global economy. The schools' extinction and the disappearance of glassmaking in this region would be a devastating loss not only to the glass community in the Czech Republic, but also to the world's artistic and cultural heritage. Tato webová stránka bude k dispozici také v českém jazyce brzy. Glassmaking is part of all of our global cultural heritage. 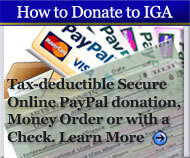 View the IGA Support Us page for information about how you can help today! 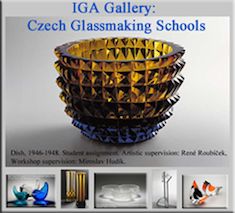 The International Glass Alliance Gallery Page is currently featuring movies and photograph slideshow galleries highlighting the three historic glassmaking schools in Nový Bor, Kamenický Šenov and Železný Brod. 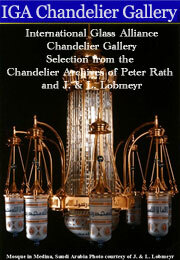 The Gallery Page highlights Peter Rath's introductory Lobmeyr Chandelier archive photograph slideshow as well as the A. Brostowitz Czech Glass Collection. Please view our Gallery Page.